I have postpartum anxiety. And I’m writing about it on my notes app at night when it keeps me from sleeping. I’ve reread this thing so many times because I am worried about sharing about this, but my therapist has encouraged me to write and share. So that’s what I’m doing. You may look at this photo of me and see a young and adventurous new mom crushing it traveling with her baby. What you don’t see are the messages back and forth between me and my therapist giving me tools to understand and manage the worry that has plagued me day in and day out. You can’t feel the panic that I was somehow completely ill-equipped rising up in my chest before this photo was taken when I was alone with Finley and she started crying. You don’t hear the pep talks with my husband trying to help me gain enough courage to face the fears that kept me inside with my daughter for the majority of my maternity leave. Many women who have postpartum anxiety pass their depression evaluations. I did. I bonded quickly and closely with Finley. I had no thoughts of harming her or myself. Aside from some major crocodile tears during the hormone dump those first few weeks with the baby blues, my mood was and is stable. I didn’t realize that the new normal I was adjusting to when I brought her home didn’t have to look the way it did. The first time I realized that maybe things didn’t have to be so hard was when I put Finley down for a nap with a baby monitor for the first time. She was a little over 2 months old and I had never left her to nap on her own before. I excitedly texted a friend while I stared at the monitor, and fortunately it was a friend who I knew had PPA after the birth of her child. As soon as I sent her that message I told her that this small victory I was celebrating made me realize that fear was controlling almost every aspect of my daily life and I wondered if I had postpartum anxiety. Then all the other things I had been dealing with on a daily basis started tumbling out into a sudden awareness over the next few weeks. The inability to fall sleep at night when she went to bed despite being exhausted. Never being able to nap or rest during the day when she napped. Intense feelings of guilt and inadequacy when she cried especially while changing her clothes or diaper. Feeling like I always had to be doing something—laundry, bottles, development activities, and not being able to stop and rest. Never leaving the house alone with her. Only leaving the house for doctors appointments. Wanting to do or try things with her but not doing them because of fear like taking a walk using the stroller or figuring out how to use our Ergo—it took 10 weeks for me to take her for a walk and 11 weeks to go alone with her in the neighborhood. Physical symptoms like lack of appetite and grinding/clenching teeth/jaw pain. Racing thoughts and many “what if” scenarios playing through my head. Inability to ask for help and avoidance of talking about what I was feeling with friends and family. So I started therapy through BetterHelp.com in an effort to understand PPA and how to manage it. More affordable than traditional private therapy and more accessible, I felt that seeking help online was my best option. I blogged previously about Finley’s birth story, so you already know that I had some anxiety leading up to her birth due to a high risk pregnancy, MG, irritable uterus, and a pre-term labor scare. You also know that I suffered from a significant postpartum hemorrhage shortly after delivery. 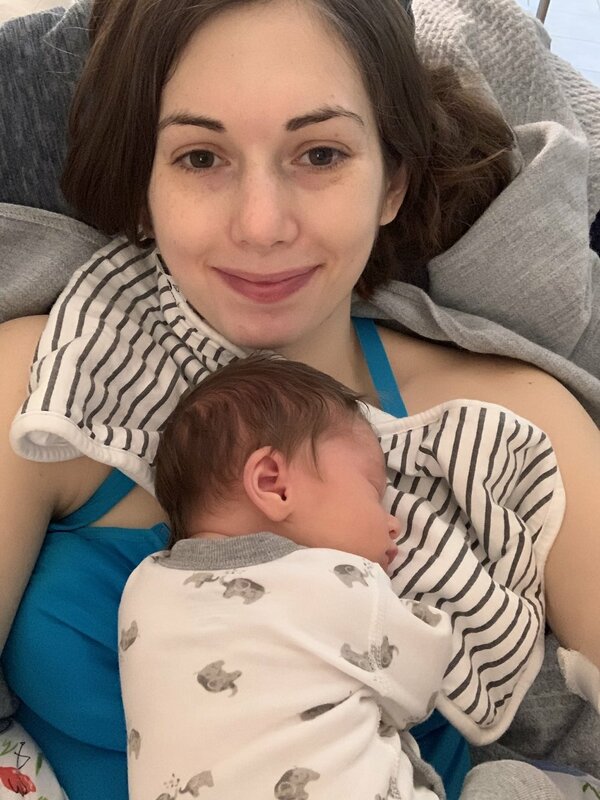 What I haven’t shared about yet is what maternity leave has been like—those weeks and months after leaving the hospital. 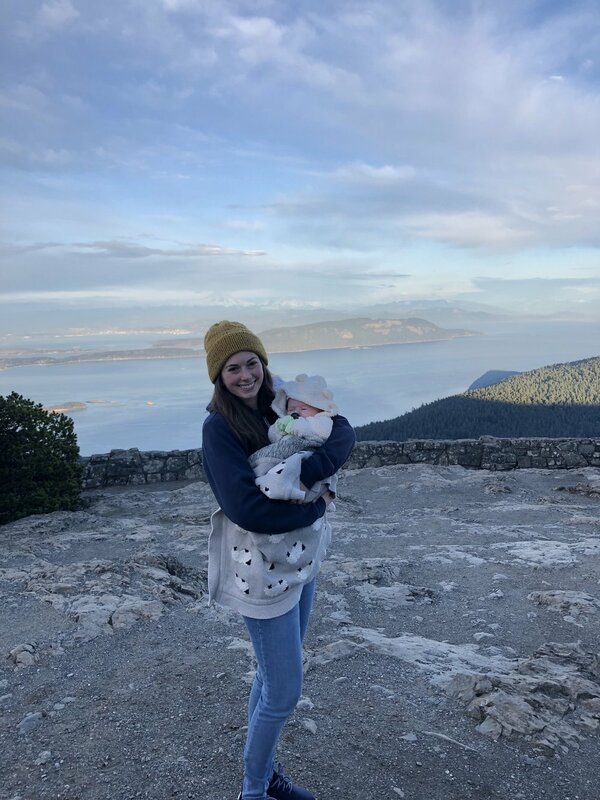 My therapist, my OB at maternal fetal medicine, and my pediatrician have all told me that what these first few months have been like has been a tough introduction to parenthood. It’s okay to have postpartum anxiety no matter what your delivery or recovery looks like. And it’s normal for new parents to have some degree of anxiousness and worry when adjusting to parenting—wondering if they’re getting enough food, if you’re holding them right, etc—but that’s not postpartum anxiety. True PPA, as opposed to expected new parent anxiety (an important differentiation my therapist explained to me), is much more intense and persistent. If you have daily intense fears and anxiety for more than 2 weeks that prevent you from taking care of yourself or your baby, you might have PPA. You are more likely to have PPA when you’ve experienced a traumatic birth and recovery complications or have a baby with medical needs. About 10% of women experience true postpartum anxiety. You can also have both PPA and PPD, postpartum depression. What we didn’t know at the time of my discharge from the hospital was how poorly my body would bounce back from that postpartum hemorrhage. The physical force it took to stop the hemorrhage and remove the clots had caused bleeding in my abdominal muscles. We didn’t know this for awhile because my body did not deal well to the volume of blood loss, and in response to all the fluids and medications I received I retained about 10-12 pounds of fluid for the first month. When I went in for my follow ups at MFM, I was too swollen for them to feel the blood pockets in my abdomen, though we suspected they were there despite not having bruising. I had no bruising at all likely due to the blood volume lost—I didn’t even bruise from the 2 IV lines that infiltrated and blew during my hospital stay (despite having a port, peripheral access was required due to risk assessment protocols). I was more swollen after delivery than I had been my entire pregnancy! The week after having Finley, I was in for my first of 4 follow ups. Someone asked me when I was due while holding a tiny 6 pound newborn, and then the scale during the vitals check told me I had literally only lost a pound after delivering her and losing nearly half my blood volume. I cried in the bathroom. At this point my heart rate was very low, blood pressure was very high, and I was experiencing low grade fevers as well. The high blood pressure meant I couldn’t receive IVIG treatment as scheduled. We tried, but for liability and safety reasons the nursing agency has to stop infusions if a patient’s blood pressure is above 150/90. I was hovering around 160/95. Normally my blood pressure is around 110/70. We had to dispose of a bottle that costs thousands of dollars by pouring it down my kitchen sink. Nearly all treatments for high blood pressure in obstetrics are contraindicated with MG, and with the delay in treatment and high risk of exacerbation postpartum, we had to take the wait it out approach. I was given the option to try a prescription diuretic to get the extra fluid off, but it came with the risk of losing my milk supply. At the time, I was exclusively breastfeeding (the only thing it seemed like my body could get right) so I declined it. We did regular blood work and I monitored my blood pressure at home between visits. Fortunately by the end of January, my blood pressure was below 150/90 so I could resume treatments. We withheld IV fluids and switched 10mg of prednisone to 100mg of IV solumedrol. High dose steroids come with their own set of problems, but treatment changes is a story for another time. It took about 6-7 weeks total for my blood levels to return to normal, my body to expel the extra fluid, and for the fevers and blood pressure to return to normal. While all this was going on with my body, we also were having our struggles with Finley’s health. When she was delivered, we stayed Friday morning, 1/4, through Monday afternoon, 1/7, because Finley needed to be monitored for transnatal MG for 72 hours after delivery. Fortunately she came through that window with no signs of my antibodies messing with her neuromuscular junctions. Unfortunately, she started developing jaundice that the hospital did not catch. Looking back, there are things I know now that would have changed or encouraged me to be more vigilant about certain things during our hospital stay. We delivered at a hospital that promoted room sharing between mom and baby. Initially I was thrilled because we knew NICU time was a possibility, but they said as long as she didn’t need breathing intervention she could stay in the room with me. That meant she was in the room with me when I hemorrhaged, even after they made Travis leave. No one came in to check on her after that whole commotion. I was unable to sit up or get out of bed. Despite knowing everyone says to walk after a c-section, I was weak and in a great deal of pain (mostly from the clot removal if I am being honest) that I couldn’t even walk to the bathroom/have my catheter removed until Sunday morning. That first day, I was on so many medications that I had no concept of how much time had passed. Looking back on our feeding log, that lack of awareness of time after the PPH on Friday meant Finley went nearly 8 hours without any milk. Around 9pm that night (Finley arrived at 12:45 that afternoon, I hemorrhaged shortly after), I finally was able to ask Travis to get the nurse to help me safely hold and nurse her. I believe that delay precipitated the start of her jaundice. We noticed her color changing pretty significantly by Monday and asked several times for her bilirubin levels to be checked again, but our nurse assured us that her last levels were only in the moderate risk category and she was not in danger so she declined to check. By the time we got her to the pediatrician on Tuesday morning, her levels were just below 17, in the high risk category, and had to be checked daily to make sure she didn’t need to receive light therapy. Babies with a level of 20 or higher must undergo light therapy to prevent brain damage. Honestly it was just a perfect storm of risk factors—c-section baby, delayed nursing, different blood types. But nonetheless, jaundiced babies tend to be lethargic and have trouble eating. At that first appointment she had already lost 11% of her body weight, which is just above normal and raises red flags when coupled with jaundice. That meant we immediately had to start supplementing with formula and were required to come in for regular weight checks. The first 6 weeks, we were at the pediatrician or on the phone with them at least once a week. It felt like one thing after another kept cropping up with her poor GI system. Once we got her eating more, we realized part of her lack of interest in feeding was reflux. When it’s your first baby, it’s hard to know what’s normal. She screamed through every feeding and was spitting up 20+ times per day. At 2 weeks old she had her first reflux choking episode when I was changing her. It was terrifying. It wasn’t even spit up. She had choked on stomach acid. We rushed her to the pediatrician and started medication shortly after, but we soon realized the severity of her reflux meant that she wasn’t getting enough nutrients. Despite our best efforts with medication, a lactation consultant, and trying every reflux recommendation in the book, it still was impacting her weight gain—it took a full month for Finley to get back to her birth weight when most babies are able to regain that lost weight within a week. At her 4 week check in, she was only in the 4th percentile for weight. Once we switched her fully to a formula from Europe (alongside all the reflux minimizing behaviors), she started to gain weight more appropriately and her jaundice eventually cleared. Who knew our little girl had such beautiful porcelain skin! She’s continued to progress and was in the 9th percentile at her 8 week check in and the 17th at her 12 week check in. I’ll say this too—it’s really hard to describe severe reflux to someone who hasn’t experienced it. They hear reflux and think “oh yeah, my kid spits up too”. Many infants have GER (common infant reflux) that doesn’t impact their ability to gain weight. They’re pretty much happy spitters, and the biggest issue is increased laundry. It is an entirely different beast when your baby is struggling to gain weight and you have to constantly monitor their airway because they frequently choke on stomach acid or have reflux come pouring through their nose regularly. That’s when they start to refer to it as GERD, which ironically, is something I’ve dealt with for almost my whole life. We have tried just about everything for her from breastfeeding to bottle feeding, learning reflux breastfeeding positions, combo bottle feeding both breastmilk and formula, supplementing and thickening feeds, eliminating common allergens from my diet, trying sensitive tummy, spit up, and elemental formulas, giving probiotics, holding her upright for 30 minutes after every feed (not an easy task for someone with a neuromuscular disease), feeding her smaller volumes more often, sleeping with a wedge, using a binky to encourage her to swallow the reflux, keeping her in one piece outfits so pants don’t push too hard on her belly, burping her after every few ounces, not burping her on a full stomach, and medication. I’m sure there are things we have tried that I’m forgetting to list. We are still dealing with it, though we are seeing improvement. We have accepted that reflux will happen more often than we would like. 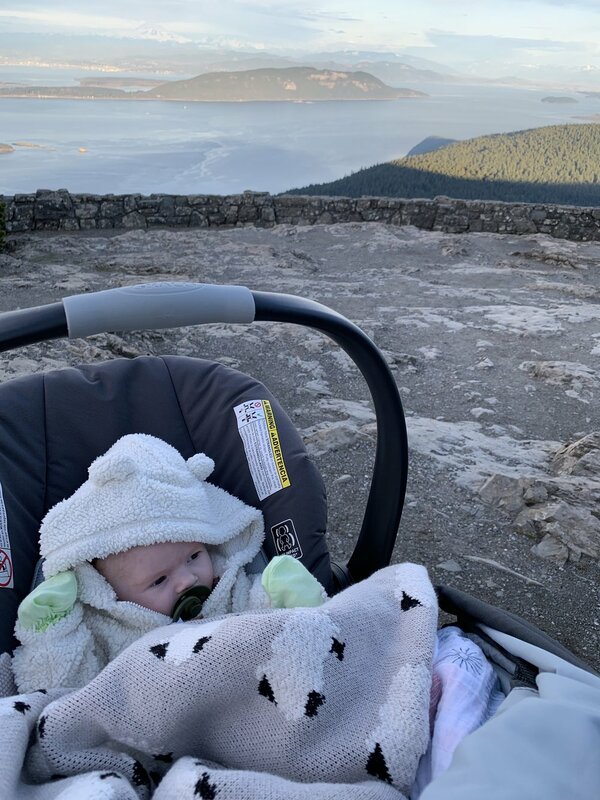 As long as her lungs are clear and she’s gaining weight, we can adjust to the coughing and gurgles and projectile spit up and wet hiccups and reflux through the nose as well as the crying that can accompany them. Those blue bulb syringes are in every corner of our house so we can quickly clear her airway when the reflux comes pouring through her nose and mouth. We do a lot of laundry... so many bibs and outfit changes! When she’s not doing tummy time or napping, she’s being held or fed upright—even her changing table is elevated. We wake up often to check on her at night because she is a silent refluxer which means we might not hear her when she starts to choke. Thankfully she is a good sleeper despite this and the night time reflux has improved a lot in the last few weeks now that we don’t have to wake her every 3 hours to eat (yay weight gain!). Through all this I’ve been pumping to maintain a full supply for our several attempts to reintroduce breast milk, though I am starting to ween down as it has become apparent that the extra IGG in my milk from IVIG exacerbates the reflux. I’m sharing the background of the struggles from these last few months because it’s both contributed to and masked my postpartum anxiety. Dealing with physical postpartum complications and a baby with jaundice, severe reflux, and weight gain issues at the same time explained a lot of the desire to stay home, the fear of leaving her to nap, the inability to sleep. It also masked the underlying anxiety that was a part of every day of my maternity leave. When I did start to open up about what we were dealing with, I was often hit with a mix of unsolicited advice, minimization, and comparisons. I wondered if I just was a complainer or couldn’t handle the new mom stuff as well as others. When someone says to me, “have you tried...? It totally made my kid’s reflux disappear”, feelings of failure and inadequacy rise up. Yes, we tried it all, and no, it wasn’t a magic fix. While I know those are all well intentioned efforts to relate to me or genuinely just want to help, I often left those conversations feeling like a failure who was unseen and unheard. I know it’s an exacerbation of the PPA. (On a related note, this is an excellent article about providing appropriate support when friends open up about their struggles). All of those things combined made it even harder for me to seek the support that I needed. If I hadn’t known a friend with PPA, I’m not sure I would have sought out a therapist throughout BetterHelp. This friend provided me with the safe and supportive space to get honest about what was going on. She helped me feel validated and supported without judgment or minimization. I also have had amazing support from friends who didn’t really know what I was going through with PPA. They have been compassionate and kind and encouraging, making an impact far beyond what they probably realize. And I have the support of Travis. There aren’t enough words to describe the ways he’s gone above and beyond to support us and provide for us. I am so lucky. It’s still a work in progress managing my health, Finley’s health, and this new parent life while starting back to work. 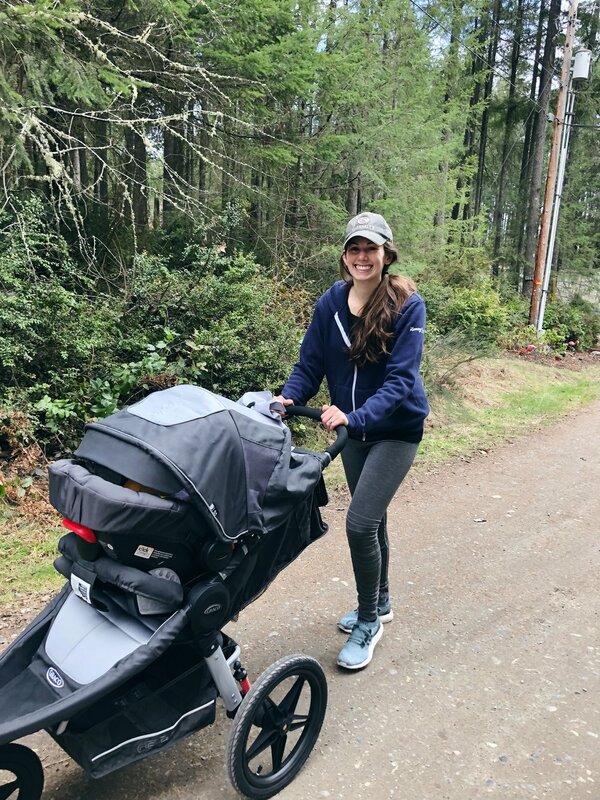 I hope by sharing my experience with postpartum anxiety, I can encourage others who may not have a friend with PPA who can help validate their experiences. And while all of this has been tough on us in ways we didn’t foresee, Finley is the sweetest, strongest, most spirited baby. We love her to pieces. Her disposition and good sleep habits have made a trying situation much more manageable. We are dealing with her reflux, working hard to keep her on track with weight gain, and I’m managing my anxiety better with the tools my therapist has provided. I even took a nap recently while she napped and left the house last week to have dinner with my parents. Maybe in another 3 months I’ll have more tips to share about supporting new moms with PPA, helping with severe reflux, or being a working mom with a disability. For now I’m still in the thick of it, but still felt that it was important to share and shed some light on why I’ve really gone MIA during this 4th trimester. Literally shedding light because I wrote this in the dark at night on my phone when I can’t sleep. I had grand plans and expectations for maternity leave—painting, day trips with Finley, house projects, organizing the annual art for MG auction, newborn photos, and breakfast dates all while exclusively breastfeeding and baby wearing this sweet girl. All things that ended up not happening. I wish my time off had been easier mentally and physically and that I could have crossed some things off my to do list or experienced some of the things I had hoped would be part of my introduction to motherhood. But in many ways, I wouldn’t want it to be any different. While I have sadness that this season wasn’t what I anticipated and that it was hard for me to ask for help, there have been so many moments of great joy seeing my daughter grow before my eyes. I’m still proud of myself for what I’ve endured these last few months, what I’ve been able to accomplish and celebrate, and that I’ve been able to ask for help, even if it was a little delayed.